Summary: After the bloody French Revolution, Emperor Napoleon’s power is absolute. When Marie-Louise, the eighteen year old daughter of the King of Austria, is told that the Emperor has demanded her hand in marriage, her father presents her with a terrible choice: marry the cruel, capricious Napoleon, leaving the man she loves and her home forever, or say no, and plunge her country into war. My friends all know this about me, but one of my go-to authors is Michelle Moran. I don't read as much historical fiction as I once did, but I know I can always depend on her for a great blend of fact and fiction. 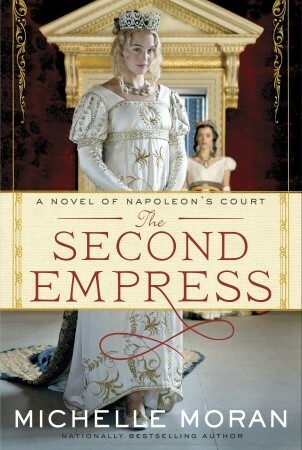 Her latest novel is THE SECOND EMPRESS: A NOVEL OF NAPOLEON'S COURT; and like all of her other books, I learned a great deal while reading it. I've mentioned this before on my blog, but I actually prefer learning history through reading historical fiction; and this novel certainly taught me about Napoleon's court and what happened after he divorced Josephine. (Heck, I wasn't even aware that Napoleon remarried and that there was a "second empress.") Ms. Moran once again did a wonderful job of showing that truth can be stranger than fiction, and that some historic characters are larger than life. Case in point: her portrayal of both Napoleon and his sister Pauline showed them to be extremely... well, delusional. Let me give you a little background... THE SECOND EMPRESS takes place after the French Revolution when Napoleon is at his most powerful. He has recently divorced Josephine because of her infidelity and her inability to give him an heir; and he demands Mary-Louise, the daughter of the King of Austria, to be his wife. Young Mary-Louise realizes that she has little choice but to accept or else throw her entire country into a war with France. That means leaving her family and her lover and possibly never seeing them again. When she arrives in France, she is determined to be a "good" wife to Napoleon, but she never realized what that would involve. Not only is she surrounded by lavish (and wasteful) parties, but she has to deal with his immense ego as well as his sister Pauline's affections. Yes -- you read that right! His sister's affections -- yuck!!!!! Pauline is quite the character (and I mean that in more than ways than one!) She is convinced that Napoleon and she should marry, and together they should rule just like the Pharaohs of ancient Egypt. She sets out to convince Napoleon of this as she schemes for him to divorce Mary-Louise. Needless to say, she's a piece of work. She even used her ladies-in-waiting as footstools and had bowls made in the likeness of her breasts! While Napoleon seeming had it all -- a powerful empire, a young wife and an heir, it still wasn't enough. That goes right back to his ginormous ego! He once again sets out to conquer other countries including Austria. Mary-Louise is caught in the middle and finds herself facing some tough decisions that will eventually affect her family and her country. I definitely enjoyed THE SECOND EMPRESS and I appreciated Ms. Moran's portrayal of these characters; however, I wouldn't go so far as to say that I loved it. I can't put my finger on the reason why. This only thing I can figure is that Napoleon and Pauline's characters were so crazy and unlikable that I had a hard time "buying" them as real. Having said that, Ms. Moran did explain in the back of the book that all of her characters' actions were based on primary research -- even the "most outrageous aspects." She actually read thousands of letters as well as memoirs of many of the major players; and while it's incredibly hard for me to believe just how cruel Napoleon was, I do think his behavior made for an entertaining story. One thing I most definitely liked about THE SECOND EMPRESS was how Ms. Moran chose to tell the story. She used three different narrators -- Mary-Louise, Pauline, and Pauline's Haitian servant Paul; and this approach gave me an understanding of Mary-Louise which allowed me to feel compassion toward her as well as an inside look into Pauline's desperation. However, it was Paul's story which gave me the most insight into the court and Napoleon's behavior as well the atmosphere in his native Haiti. In addition, because he was in love with Pauline, it did make her slightly (ever so slightly) more human to me. As is the case with all of Ms. Moran's novels, THE SECOND EMPRESS would make for an interesting book club discussion. Needless to say, Napoleon and Pauline are fascinating in their craziness, but Mary-Louise is also rather interesting. There is supposedly a reading guide available; however, I think it's still a work in progress. Some of the themes that you might want to discuss include loyalty, mental illness, dysfunctional families, love, and sacrifice. In addition, Ms. Moran is available for calling into your meeting. Trust me on this, she called into one of my book club's discussions a few years back and she was delightful and fascinating! Overall, I'm not sure this is my all-time favorite novel of Ms. Moran's, but I still enjoyed it a great deal. I definitely recommend THE SECOND EMPRESS to fans of historical fiction and especially those with an interest in Napoleon's empire! I need to read Michelle Moran's French set books. I loved the Egyptian ones and I am looking forward to the Indian ones too. I still need to try Moran's work. Since I don't read much historical fiction, I tend to be picky about it, and I've heard she's one of the best! I cannot wait to read this book. I loved Josephine so much in school that I did a whole 30 min. presentation on her and Napoleon! His second wife is not really talked too much about. I've only just started getting into Ms. Moran's books but I know others absolutely love her. I honestly wasn't aware that Napoleon divorced Josephine, so now I am definitely interested in seeing how this all plays out. Thanks for a great review! I've been wanting to read this one -- and WOW, I had no idea about Napoleon's sister. Yuck is right.